Republican state Sen. Steve O'Ban speaks at a news conference on mental health in Fife on Wednesday. A Washington state senator who says he’s heard from “literally hundreds of parents” of adult children who are struggling with mental illness or addiction wants to allow families to petition for temporary guardianship. 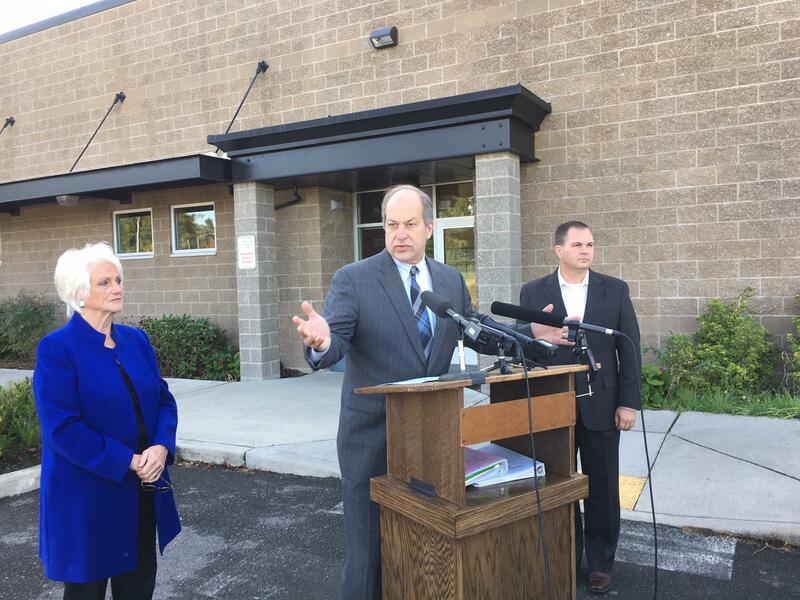 Republican Sen. Steve O’Ban unveiled his proposed guardianship program Tuesday outside a Pierce County crisis center. He was joined by two fellow Republicans who offered their own ideas to address the state’s mental health crisis. “We need to empower parents and other loved ones to have the authority to rescue that adult child who needs that care and is not getting it,” said O’Ban, the ranking Republican on the Senate Human Services and Corrections Committee. Guardianship is typically associated with older or disabled adults who can no longer make decisions for themselves and are found by the courts to be incapacitated. Under the law, it’s designed to be a last resort. Jerri Clark, of the group Mothers of the Mentally Ill, said some sort of limited guardianship makes sense. “But it needsto be responsive to the reality of mental illness which is not a static condition,” Clark said. Under O’Ban’s proposed law, immediate family members could ask a court to give them guardianship of a “gravely disabled” loved one for up to one year. During that time, the family could make treatment decisions on behalf of the individual. Mental health professionals could also make a referral for guardianship. O’Ban said his proposal was modeled off a mental health “conservatorship” program in Los Angeles County. Democratic state Rep. Laurie Jinkins, who chairs the House Judiciary Committee and works on mental health issues, said she was open to considering O’Ban’s proposal during the 2019 Legislative session, but wasn’t sure it would pass constitutional muster. “I have a feeling that there’s going to be a lot of devil in the details,” Jinkins said. Jinkins noted that Washington recently passed an “assisted outpatient treatment” law that allows courts to supervise the treatment of patients who are in the community, as opposed to in a state hospital. Another mental health proposal from Senate Republicans, who are currently in the minority in the state legislature, is to provide at-risk students access to mental health appointments at school through telemedicine. “We have to look at how we’re delivering care in the schools and re-think how it’s being done,” said Sen. Randi Becker (R-Eatonville), who plans to sponsor a telemedicine bill in 2019. Sen. John Braun, the ranking Republican on the Senate Ways and Means Committee, also said he would urge the Legislature to send voters a $500 million bond measure to build more psychiatric beds in the community. “We have a real problem here and it’s a problem that will take, frankly, years to fix,” Braun said, adding that an infusion of cash would speed the timeline for building more capacity in the community. Jinkins called Braun's bond proposal “an interesting idea,” but said she’d like the Legislature to commit to mental health funding without going to voters. “It would be best for us to be able to pay for these facilities within our current budget,” Jinkins said. Lawmakers on both sides of the aisle have signaled that mental health will be a top issue during the 2019 Legislative session. Governor Jay Inslee and legislative Democrats are expected to unveil their own proposals to shore up the mental health system in the coming months. In May, Inslee, a Democrat, and a bipartisan group of lawmakers called for a five-year plan to move civil, or non-criminal, patients out of the state hospitals and into new 16-bed community-based facilities that have yet to be built. Bringing urgency to that plan is the fact Western State Hospital recently lost federal certification and with it approximately $53 million a year in funding. In recent weeks, there has been a series of high profile assaults of staff by patients at the 850-bed, century-old hospital. “That’s another example of this crisis that impacts our state,” O’Ban said.